Born in Northern Ireland in 1976, Jo Burns lives in Germany. 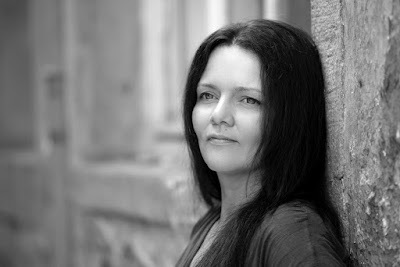 Jo's poetry has been published widely in journals such as Oxford Poetry, Southword, Popshots, The Tangerine and Magma. Jo won the McClure Poetry Prize at the Irish Writers Festival in Los Gatos, CA and the Magma Judges Prize Poetry Competition 2018. Her debut pamphlet Circling for Gods was published by Eyewear Publishing. Her first collection White Horses will be published by Turas Press in November 2018. 1 - How did your first book or pamphlet change your life? How does your most recent work compare to your previous? How does it feel different? I think that my first pamphlet Circling for Gods (Eyewear, 2018) helped me to finally have the confidence to drop the word “writer“ into conversations when introducing myself. Beforehand, without a published body of work, using that word felt slightly presumptuous as writing has always been an intensely private thing for me. It felt almost like a coming out. Many people in my daily life had no idea that I wrote poetry at all. My forthcoming collection White Horses by Turas Press was written in a 3-4 year timeframe. For the past few years, in particular since 2016, the topics of patriarchy, intermingled with how we express faith (or not!) have been the themes that keep pulling me in. It differs. Very, very, occasionally a poem writes itself. One example being when my son was having an MRI in a German Helios clinic. The name Helios, the circular form of the machine, the unknown ahead, with images of Phaethon, gave themselves to a poem which was scribbled down in about 10 minutes. However, the majority of the time my poems develop over years of notes, retitling and multiple drafts. If a poem is just not working, I do try to put it away and come at it again from a different angle. Quite often I end up with a completely different poem. Generally with an image that fixes itself in my brain and won’t let loose. Then I start exploring ideas around that image. Quite often my final lines in a poem were the initial images or ideas for the poem. I rarely write with a book in mind. It just so happens that I get stuck on certain themes, so that many of my poems speak to each other or revolve around the same idea. But a lot of sifting and reordering and culling takes place when I try to put all my poems together into one body of work. I enjoy public readings and make every effort to do them. I get nervous, and am not always sure that my delivery does the poems justice. However, I enjoy meeting fellow poets, who tend to be (in my experience) 95% of most poetry reading audiences. I often ask myself if my poem somehow contributes something important to an existing body of thought. Is it worth a readers time or is it purely self involved? I have a hard time with those thoughts and second guess my poems before I send them anywhere. Possibly too much. I can’t speak for all writers, only myself. I try to catch moments of thought. What is happening in the world? What are the issues that are, in my eyes, important? When my kids are grown up and their kids ask “what were people concerned with in 2018“, I would hope that some of my poems shed some light on that. My poems are probably my own personal time capsules, waiting to be dug up. In general life, be kind, no matter what. In poetry, the same. I write in the mornings when my three children are at school. Generally I will write for about an hour, sometimes two and spend some time editing older work. Once that’s done I worry about admin, submissions, bills, emails etc. Some days I take a complete break from it. There are days when sometimes there is just nothing you want to write. The forest. I live in Germany between the Spessart and Odenwald forests. A long walk always brings me the word or idea I was looking for. Hay. I grew up in the Northern Irish countryside. Due to my scientific background, science does tend to inadvertently creep into some of my poems. I find there are a lot of correlations between poetry and scientific thought. Precision, for example. Paintings also feature often, although it’s been a while now since I wrote an Ekphrastic poem. Current affairs move me to explore certain topics, although at times I have to stop reading the news to be able to mentally slow down and concentrate on a poem. Seamus Heaney grew up in the same area as I did (Albeit years before me). When I read his poems I feel like I can reach out and touch home. The same applies to a lot of Nick Laird’s work and many other Northern Irish poets. In terms of international voices, there are far too many to mention. It feels like poetry is currently so alive and diverse that I have a hard time keeping up with my peers and new work. I would like to see a few of my poems as film poems. I think I’m exactly where I’m meant to be. However, I do always have this niggle that I could have been a great detective. Something to do with searching, I guess! I can’t paint and I’m rubbish at saxophone. Words come slightly easier. I recently watched the Wim Wenders Docu-film on Pope Francis. I loved it’s message of hope and humility. The last book that hooked me to the very end was Tim Marshall’s Prisoners of Geography. Im currently working on the proofs of my first full collection “White Horses“ by Turas Press. It will be launched in November 2018. Also, I am starting to collect poems for what will hopefully be my second collection. However that’s a few years away, so I’m taking it slowly. I’m not quite sure in what direction my newer poems are going. I expect current affairs will continue to shape them.